On this day, 22 December, in 1715 James Stuart, the ‘Old Pretender’ landed at Peterhead from exile in France on his second and final attempt to seize the throne of Britain. On the same day in 1938 a more ancient and somewhat less anticipated landing occurred. The so-called ‘Living Fossil’ the Coelacanth was caught in the Bay of Chalumna off the coast of South Africa. Cast of a recently dead Coelacanth. This is part of the University of Aberdeen’s Zoology Museum collection. Photo by Martyn L. Gorman. The fish, which was believed to have been extinct for 50 to 70 million years, had before then only been known by the fossil record (Beeching, 1997: 219 & AAAS, 2000: 2065). Many palaeontologists had considered that it was possible that the Coelcanth was a relative of the bold fish which first began to venture on land about 370 million years ago and led, ultimately, to human beings. It was a bold belief based upon the lobed fins the curious looking fish displayed. To many experts these lobed fins were not wholly dissimilar to the primitive tetrapod limbs of our distant land ancestors (Roush, 1997: 1436). To this day, very little is known of this elusive fish despite the fact that since its original official discovery many have been caught (between 2004 and 2007 at least 32 were caught). Indeed, as Eric Verheij, acting director of the Nature Conservancy’s Palau office noted in 2007: ‘It looks like more coelacanths have survived than people initially thought.’ Despite this, the Coelacanth is considered by the IUCN to be Critically Endangered. It is understood to be able to weigh up to 100 kg and has been caught from the East African coast all the way to Indonesia. However, it is believed that the main population resides around the Comoros Islands just off the coast of Mozambique where over 180 have been caught (AAAS, 2007: 1401 & AAAS, 2000: 2065). The 1938 specimen (which was caught by a commercial trawler) piqued the interest of Marjorie Courtenay-Latimer of the East London Museum. The fish’s corpse caught her eye at a local fish market and struck her as unusual. Nonetheless, Courtenay-Latimer did not realise it was the Coelacanth and as the museum’s officiating ichthyologist, J.L.B. Smith of Rhodes University, Grahamstown, was in Johannesburg she resolved to save the fish’s remains for later study. 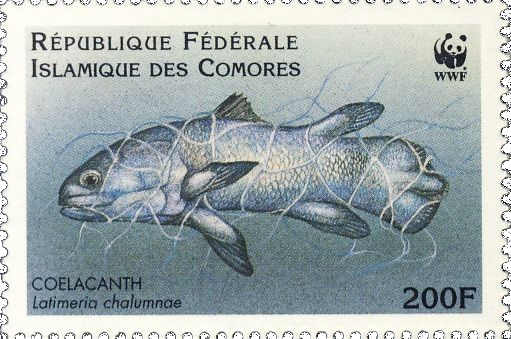 In honour of this moment Smith named the fish Latimeria chalumnae in reference to Courtenay-Latimer and its capture point at the mouth of the River Chalumna (Churcher, 1997: 370). The remains of this example were, however, rather thin with Courtenay-Latimer only able to save the head and skin of the rotting fish. Smith thus opened a search for a full specimen of the creature. After many years of searching which included a leaflet campaign in the Comoro Islands offering a cash reward for a capture Smith finally had word in 1952 of a capture of a complete specimen. Smith now had to persuade the South African Prime Minister D.F. Malan to direct a South African Air Force Dakota DC-3 plane to the Comoro Islands to collect the specimen. J.L.B. 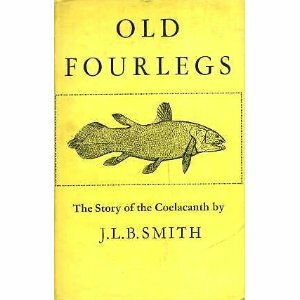 Smith would publish ‘Old Fourlegs’ on the Coelacanth. Clearly the insinuation in the title was to the Coelacanth being a distant relative to the tetrapods being, like them, a member of the ‘lobe-fin’ family. The idea of ‘romance’ in relation to such an superficially unattractive creature may seem curious. However, it continues to fascinate many. What is more, its position in regards to the early and tetrapods is still much debated and largely inconclusive. 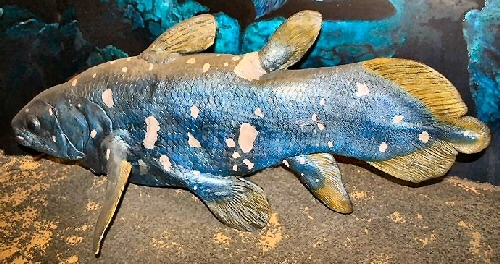 The Coelacanth’s current position as the unofficially crowned closest extant fish ancestor may be as uncertain as the Jacobite pretender’s to the British throne was. However, rather like James Stuart its romantic history seems pretty certain to continue to captivate future generations. Beeching, Cecil Leslie. 1997. Dictionary of Dates. Oxford: Oxford University Press. Holden, Constance. 2007. ‘Saving the Coelacanth’. Science 316: 1401. Roush, Wade. 1997. ‘”Living Fossil” Fish is Dethroned’. Science 277 (5331): 1436.